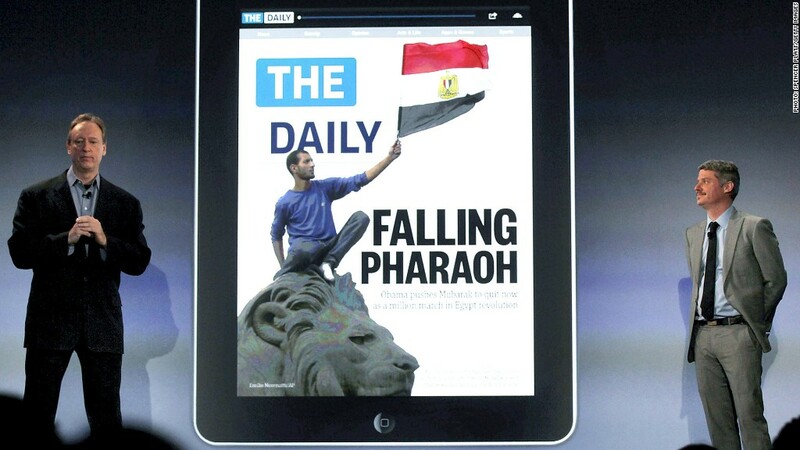 Launched two years ago at a splashy event, The Daily is ending its run this month. In the digital age, the shuttering of newspapers has become routine. But it seems even a newspaper designed for the gadget world can't survive: News Corp. is folding The Daily, its tablet-focused publication. News Corp. (NWS) and CEO Rupert Murdoch poured $30 million into the launch of The Daily, which first hit tablet screens in February 2011. The newspaper was initially available only on Apple's (AAPL) iPad and it later expanded to other tablets like Amazon's (AMZN) Kindle Fire and devices running on Google's (GOOG) Android. The venture garnered criticism immediately upon launch, with naysayers questioning the wisdom of targeting a growing but limited potential readership: tablet owners. Just a few readers wouldn't be enough to pay the bills. In addition to an initial $30 million investment, News Corp. also committed around 100 staffers to The Daily and estimated it would spend $26 million a year to keep the newspaper running. News Corp.'s press release on Monday highlighted those obstacles. Murdoch called The Daily "a bold experiment in digital publishing," but admitted that the newspaper didn't take off with readers. "Unfortunately, our experience was that we could not find a large enough audience quickly enough to convince us the business model was sustainable in the long-term," Murdoch said. The Daily -- which costs 99 cents per week on the iPad and $1.99 to $3.99 a month on other tablets -- will publish its last issue on December 15. Technology and other assets from The Daily, including some staff, will be folded into News Corp.'s New York Post newspaper. Rumors had surfaced just a few months ago that The Daily was on death watch, but editor-in-chief Jesse Angelo slammed "the haters" in a public letter. "As for the latest misinformed, untrue rumors of our imminent demise, I would urge you to ignore them," Angelo wrote in July. "Since before we launched, our dear friends at competing media outlets have done their best to wish us ill and gleefully 'report' on what they think is going on here." Angelo talked up The Daily's "over 100,000 paying subs who are renewing their subscriptions at a 98% rate and fantastic advertisers who love our brand and keep coming back for more because they get results." Unfortunately for those subscribers, soon they won't be able to come back for more -- at least at The Daily. AOL-owned (AOL) Huffington Post launched a paid iPad-only magazine earlier this year, but was forced to make the publication free of charge after only five issues.